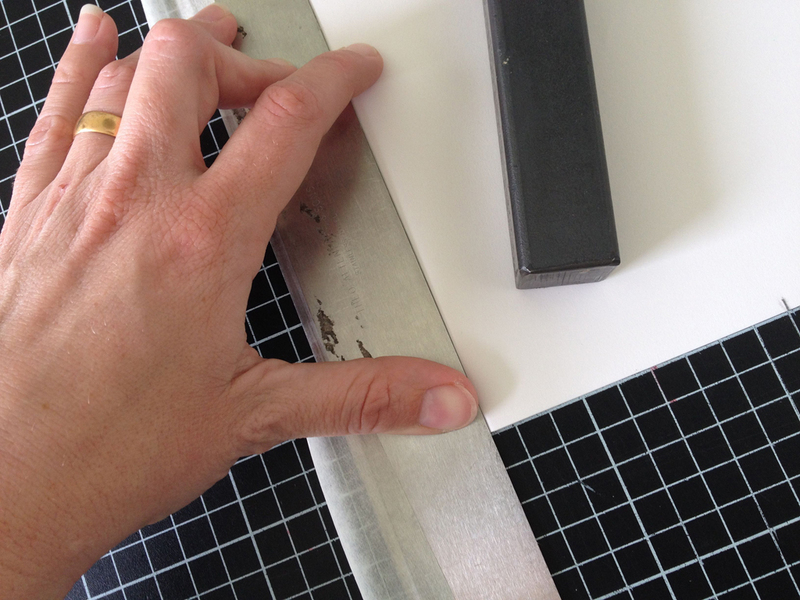 Not every house is equipped with a guillotine, board shear, or cutter, but this shouldn’t stop you from being able to trim your sections for your books to identical dimensions. 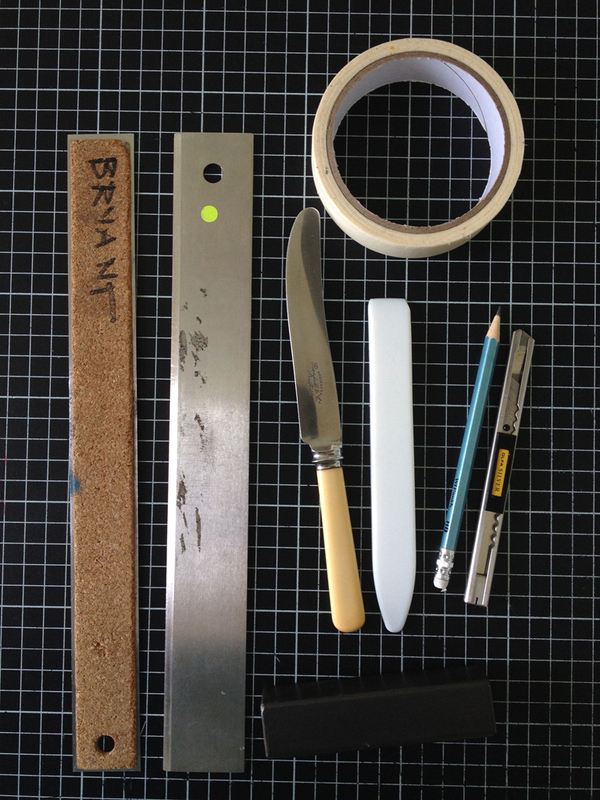 Here is the system that I use when I am away from my bindery. 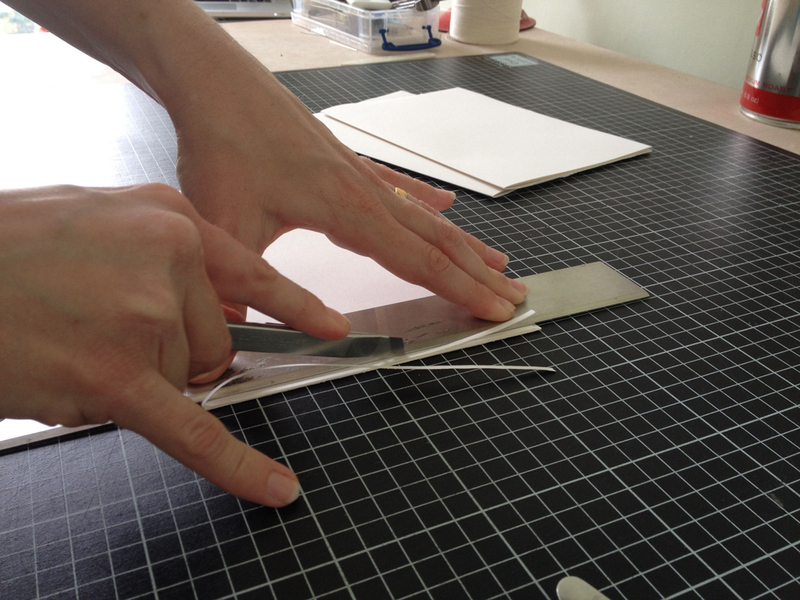 This post goes out to bookbinding workshop students past and future. 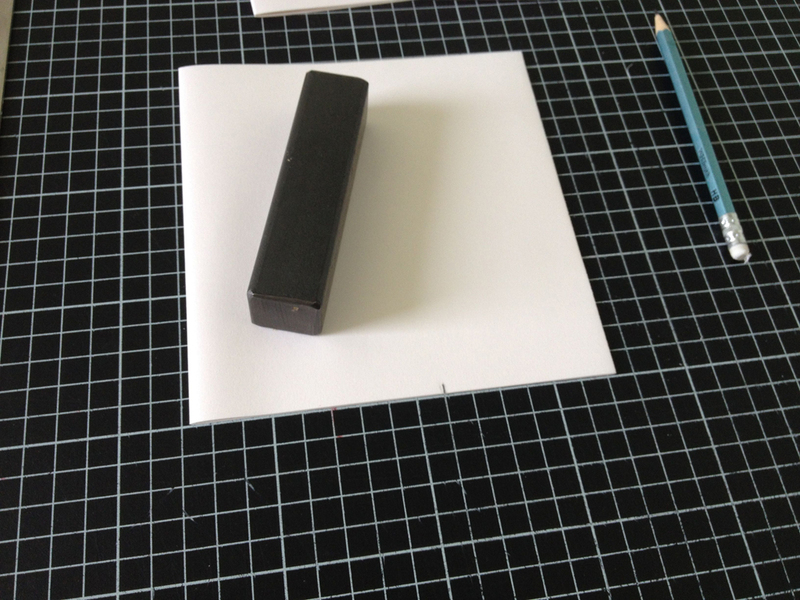 two straight edges, one of them preferably with a thick edge. 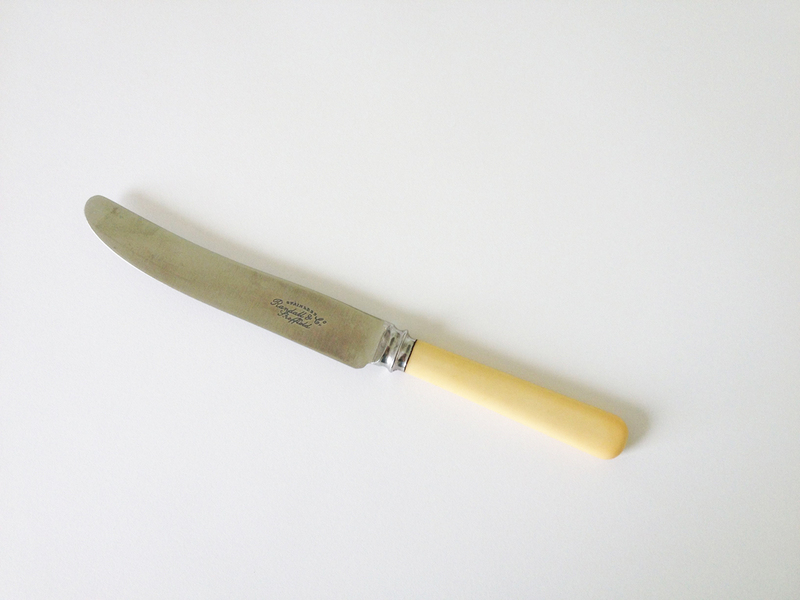 a paper tearing knife (I use a butter knife) No serrated edges! 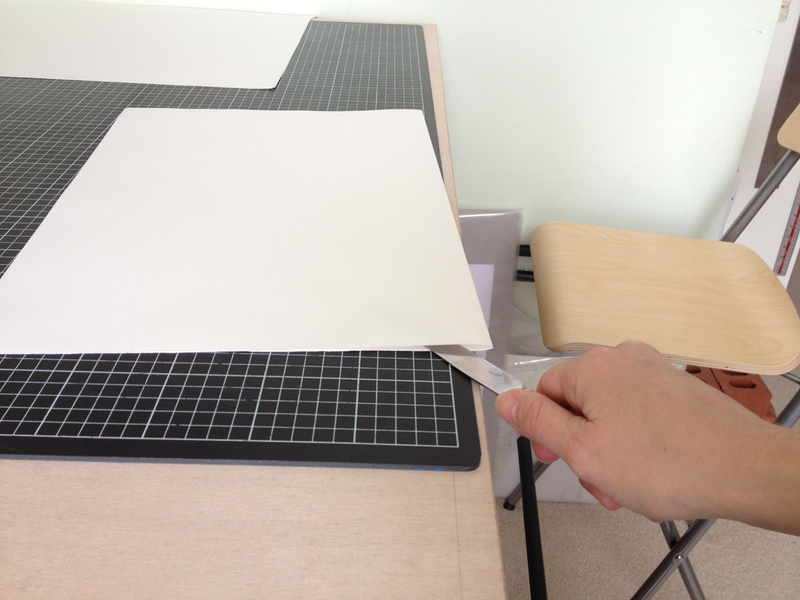 Fold your large sheet in half, taking care that the corners line up. Break out the butter knife! 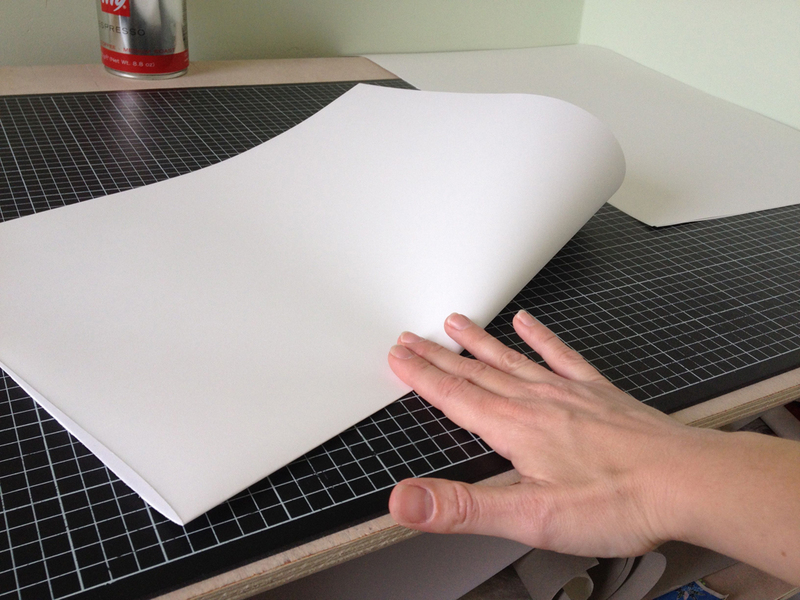 position your paper on the edge of your table and carefully tear your paper at the fold, keeping the knife blade flat. You really do need a dull blade for this, which is why I prefer my butter knife to a paper tearing knife with a sharp edge. You should be pulling the knife out and away from the fold. Do not try to tear by pulling the knife in the direction of the fold, this will make a messy tear. Tear in short bursts. 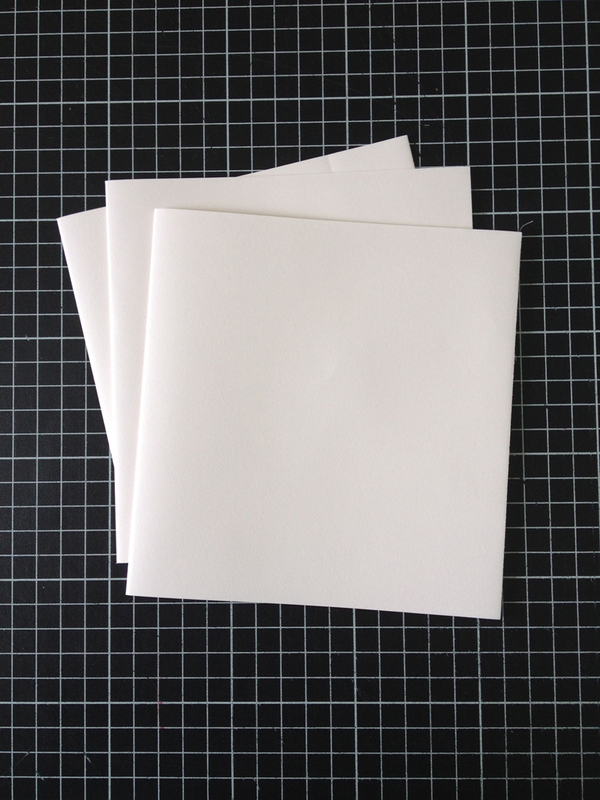 You now have two sheets of identical size. 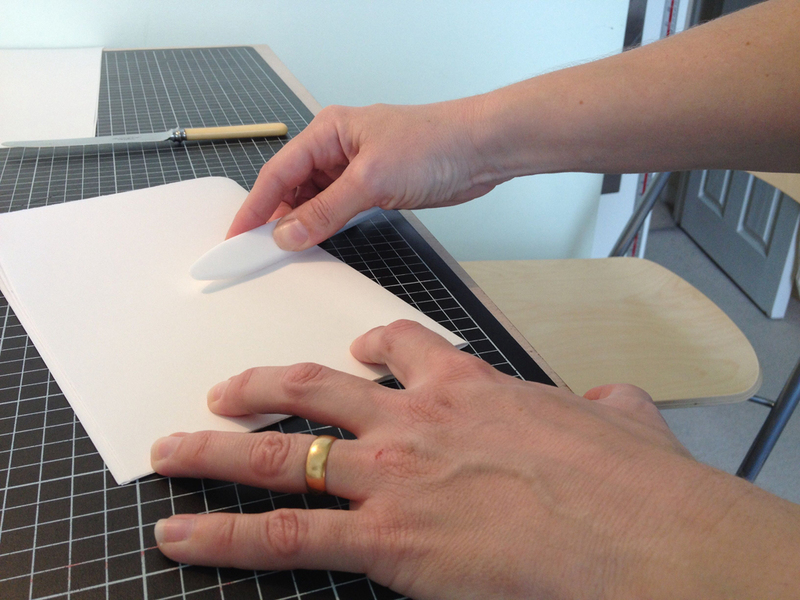 Fold these in half together and crease with your bone folder. 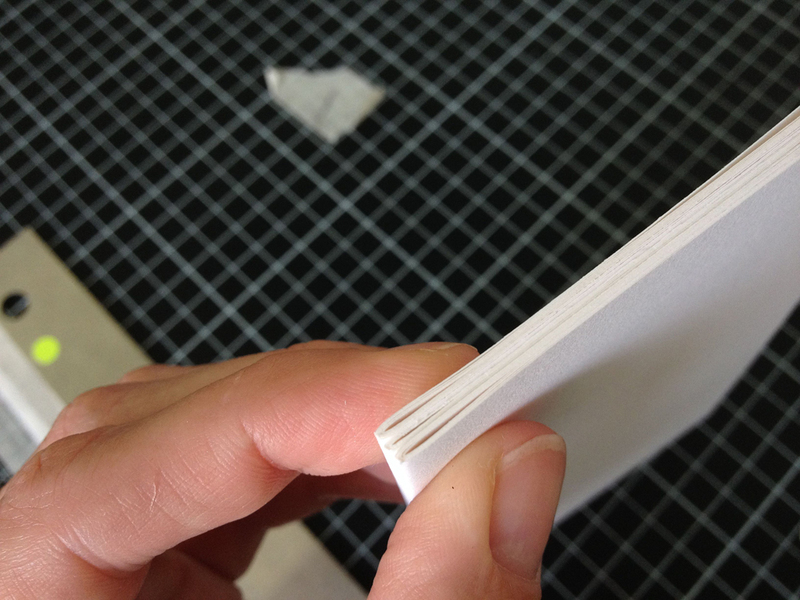 When you have folded them together, tear them in the same way. 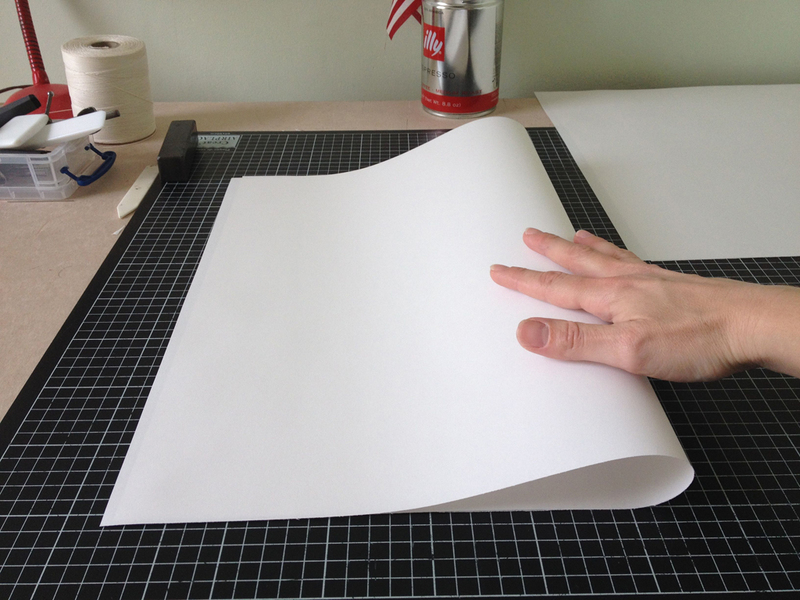 You should be able to tear through two layers at once without a problem. If this proves difficult however, tear them one at a time. 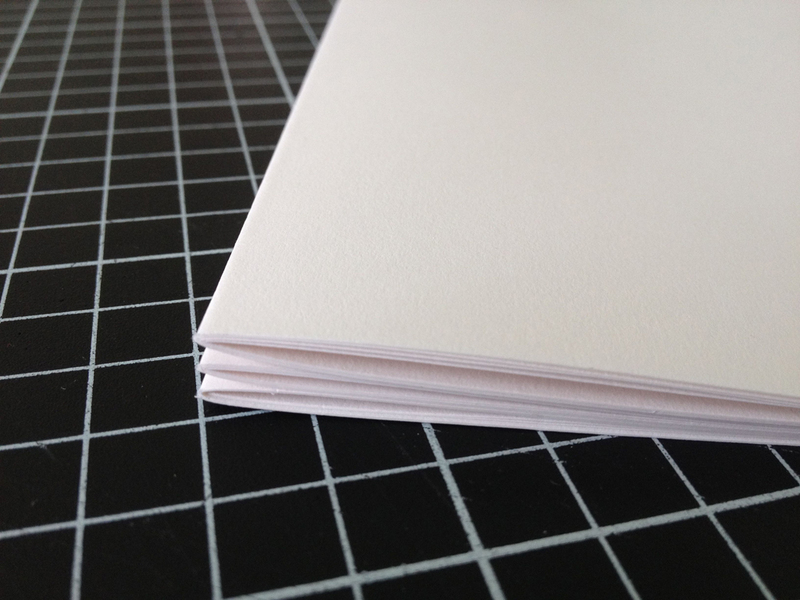 It is important to note here that the paper grain should be parallel to the spine. If your grain is not parallel at this stage, you must tear the sheets down once more. 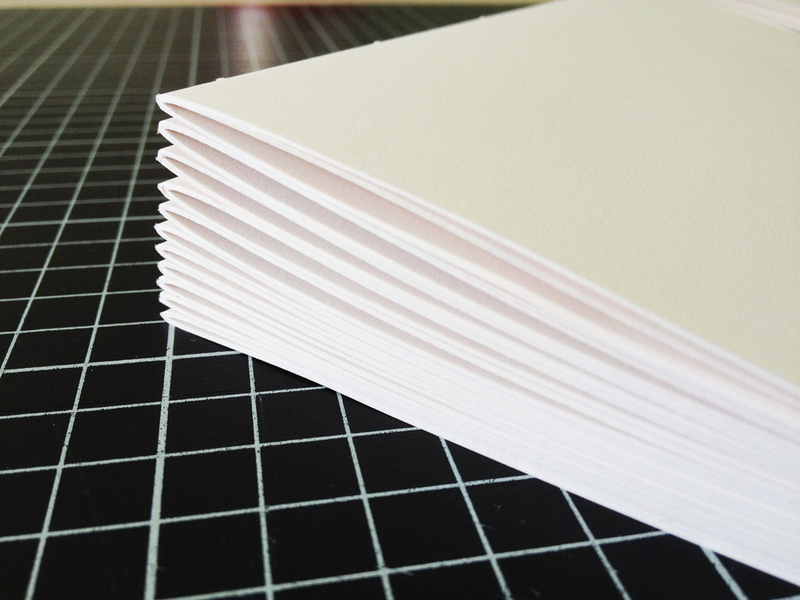 Tear them in batches of two sheets at a time rather than trying to rip through all four sheets at once. But if you’d rather have crisp edges or the size of your torn sections is just not going to work, then it is time to get trimming. 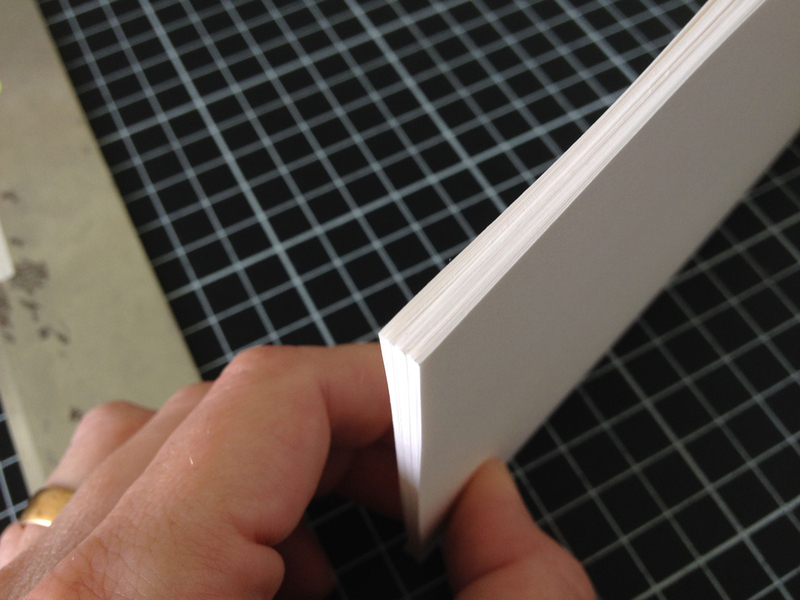 It is important to trim these sections in stages, repeating each step for every section before moving on to the next step. 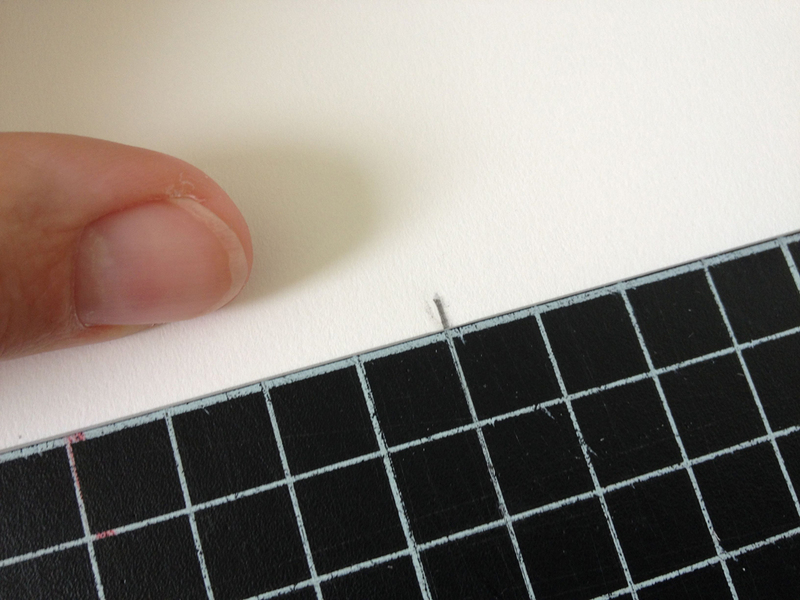 Editioning the cuts in this way is what makes it possible to cut the sections to identical size. Start by aligning the spine of one section with a line on the grid. Here is some seriously geeky advice: These lines have a thickness that can be close to a millimeter or more. 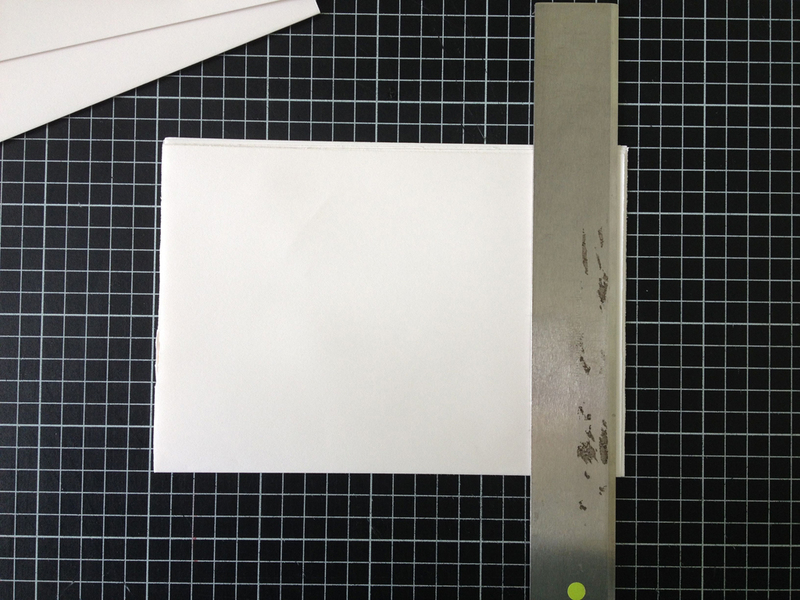 To ensure that you are cutting things squarely, always align your section and/or your ruler to one side of these lines rather than smack in the middle. 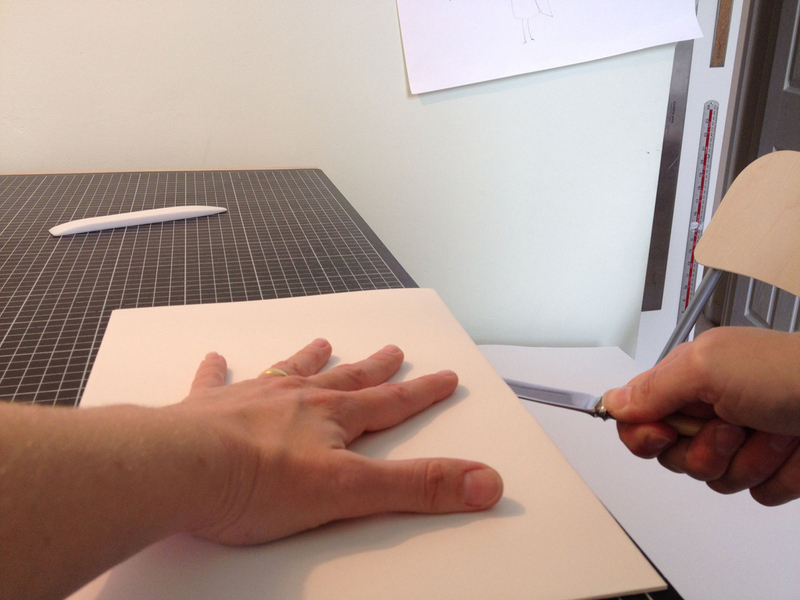 This way you can be confident that your cut isn’t sloping slightly. 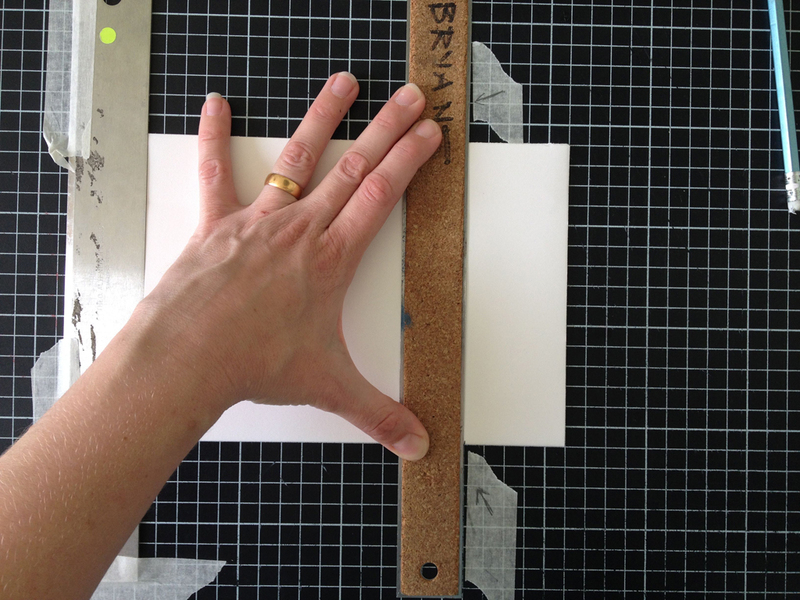 Now align your ruler or straight edge with a perpendicular line close to the edge of your section. The measure here is not important. 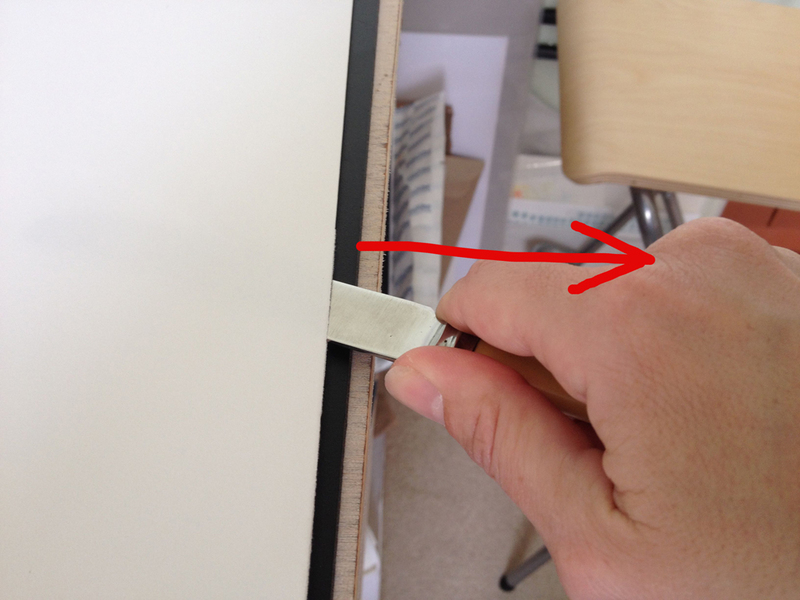 Using your knife with a sharp blade, cut the end off of the section. 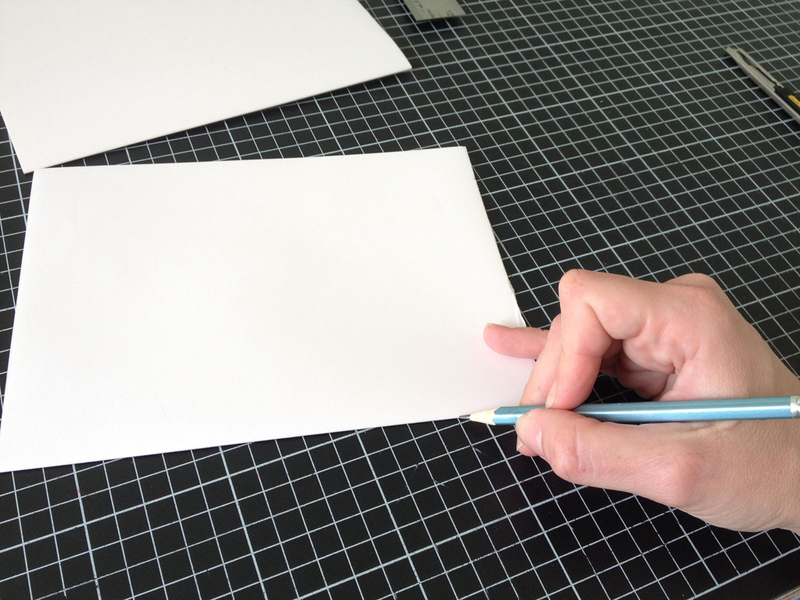 Do not try to go through all of your pages at once, but rather make a series of light passes, keeping your blade flush against the straight edge. Repeat this step for all of your sections. See? Ok time for the second cut. 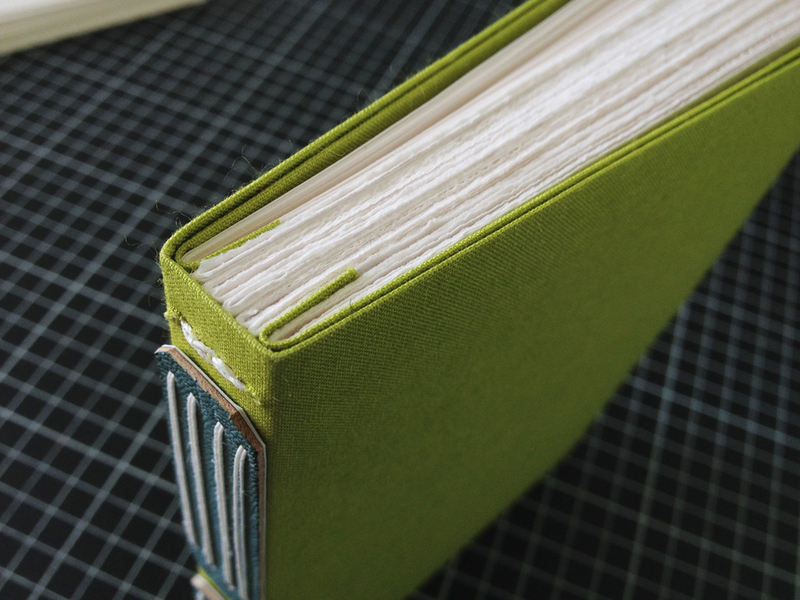 With a pencil, mark the desired height of your finished book along the spine of one of your freshly trimmed sections. 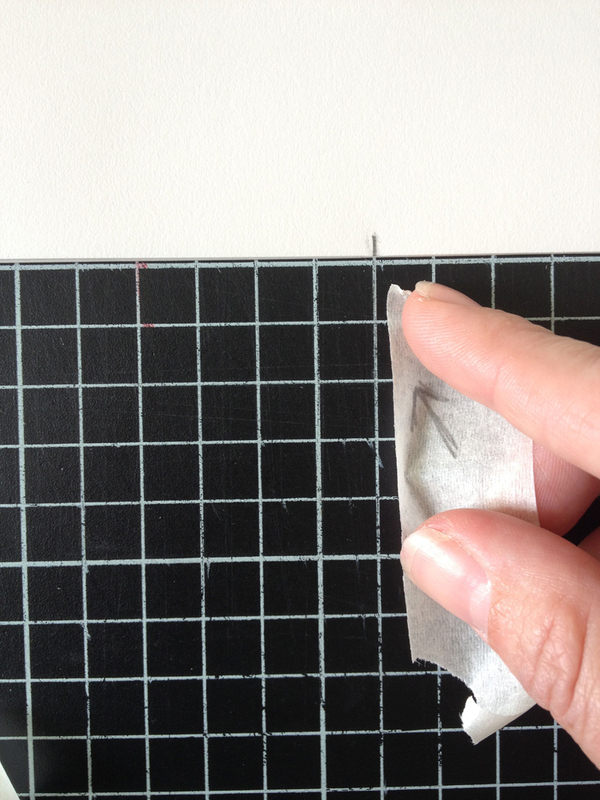 Align the spine with a line on the grid and that pencil mark with a perpendicular line. 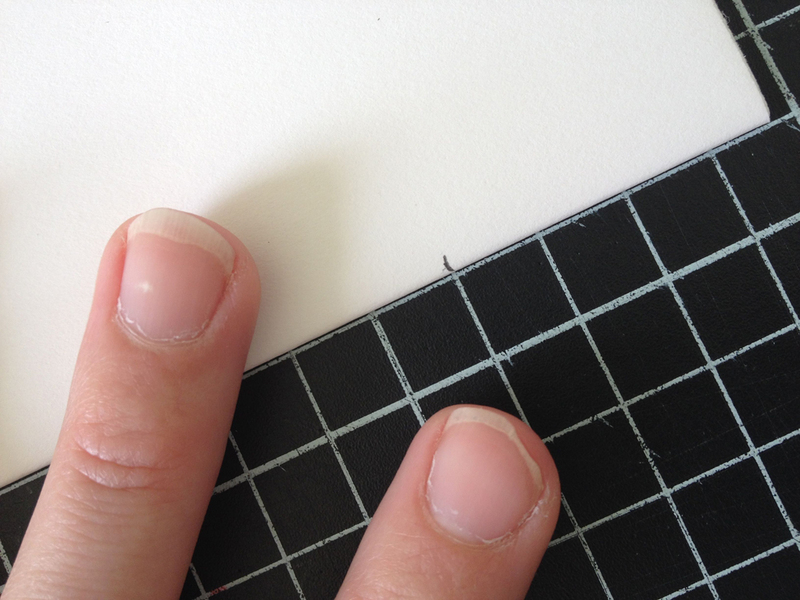 Admire your perfectly manicured fingernails and take a photo of them to show your blog friends. Now here is where the action is. 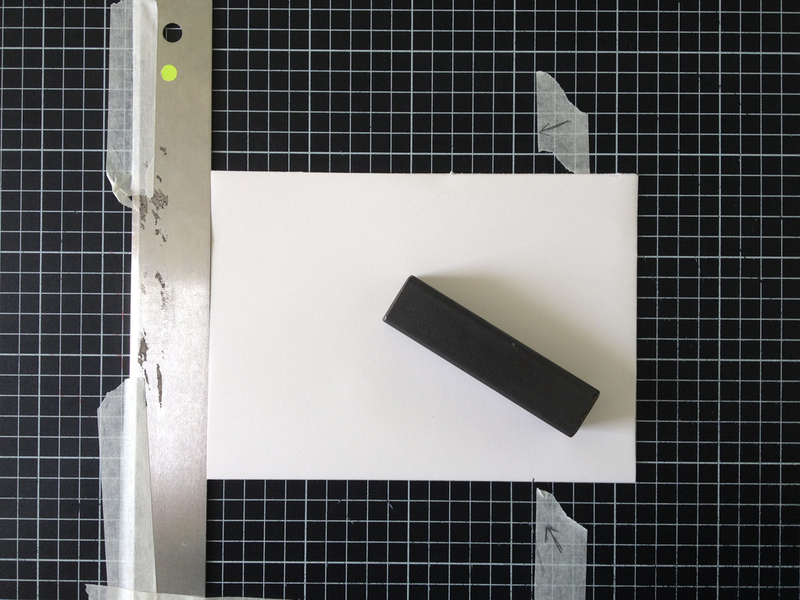 Set a weight on that section after it is sitting just where it should be on the grid and carefully bump your thick straight edge (or a piece of board or whatever thick edge you have on hand) to the trimmed side of that section. 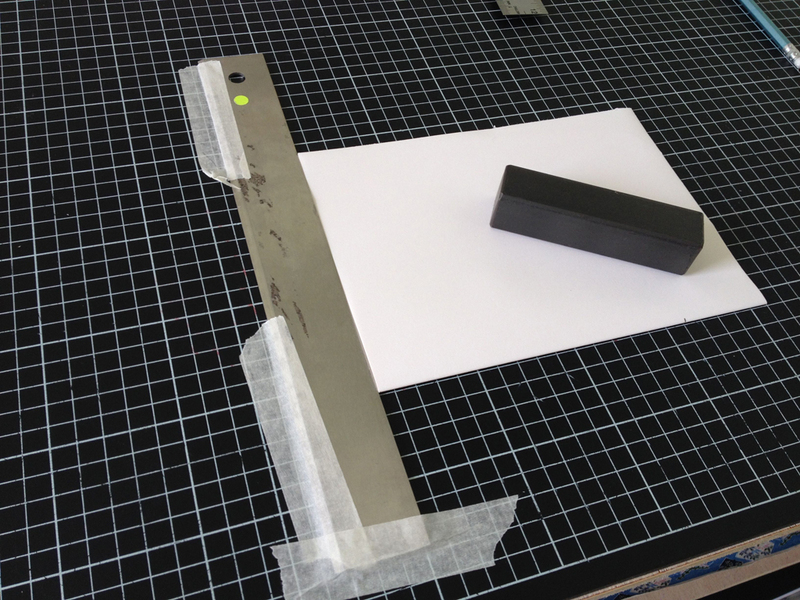 Tape that straight edge down securely. 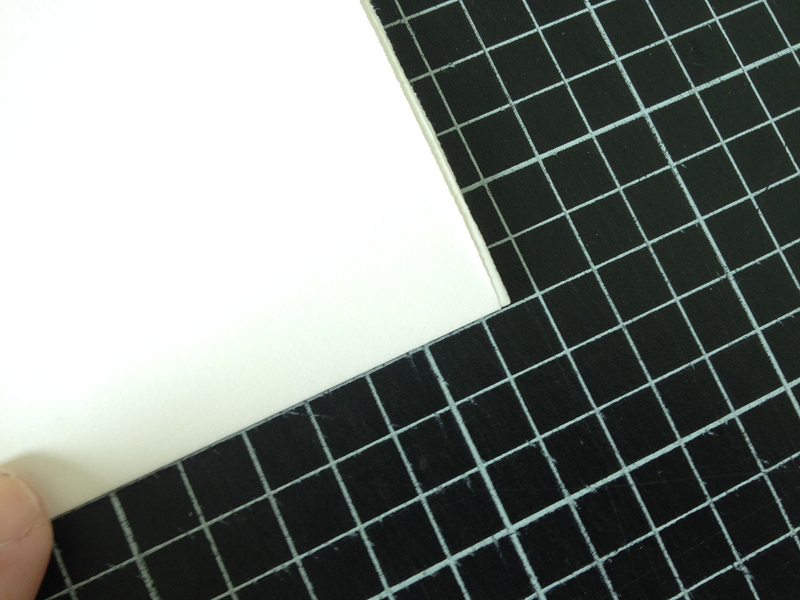 Now you should be able to trim all of your sections to the same height by bumping the trimmed edge up to the straight edge and cutting to that line on the grid. Repeat this cut for all of your sections. Depending on how many sections you are trimming, you may want to watch Damages at the same time, as I am demonstrating below for your benefit. I bet you know exactly what to do now, but I will continue this photo-essay anyway thanks to the New England Protestant Work Ethic instilled in me by my forebears. 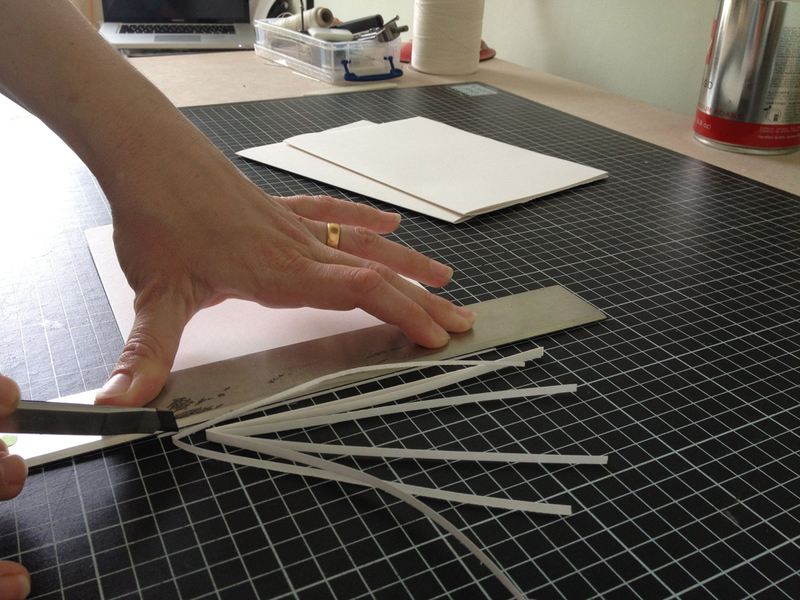 This system is one of many that you can use to trim sections to size, every bookbinder does things just a little differently. If you find that cutting sections by hand is too laborious, it is time to look into getting one of these or one of these or one of these. Wonderful. Thanks. 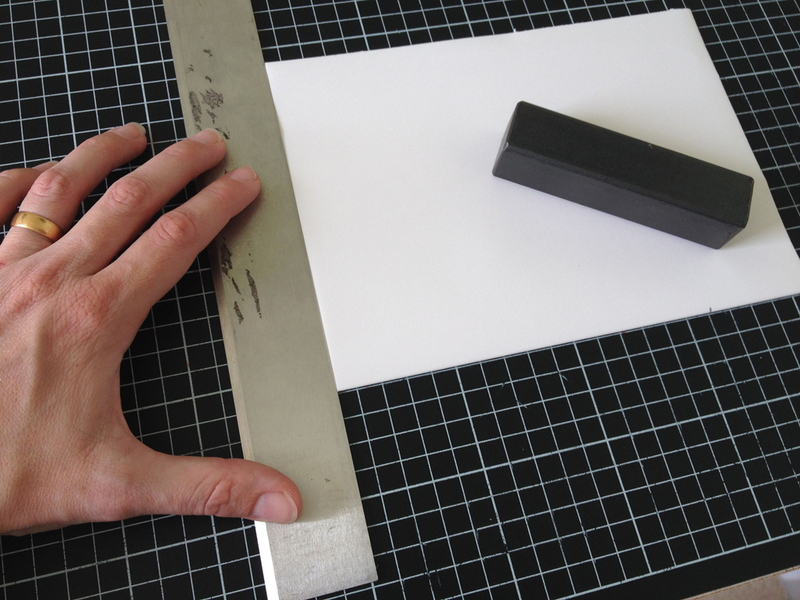 I have some large sheets of paper that won’t fit in my cutter and will use this method. Excellent! I am glad it was helpful! PS: Oh! my favorite tip was the one of the lifted foot! i am definitely going to try that! Man oh man those cousins are BEEE-autiful! Great! Time to trim trim trim! Woohoo! Excellent! Break you the knives! 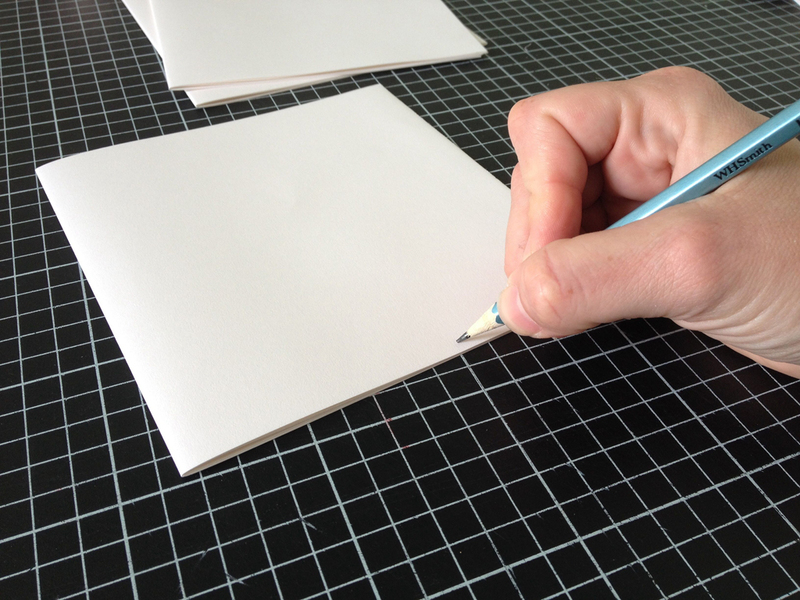 Break out the paper! Break out the folders! Great instructions! And I will use your wonderful one foot technique when I teach this weekend! Love your blog for all kinds of reasons! Hi Nancy, So glad you found them useful, and that you like the blog! I give you to one foot salute! Excellent! I am so glad it is useful to you. Good luck to you and thanks for reading. I am waving to you from the South Coast of England. Thank you so much! I will forward to my students. Even those who do not read English will understand, thanks to the pictures. Sharing tricks of the trade like you do, and with humour, is really great. Thanks so much Hélène! I am so pleased that you’ll be sharing this. Best wishes and hello to you and your students from Brighton, UK! Oh it’s just like being back at West Dean with you! 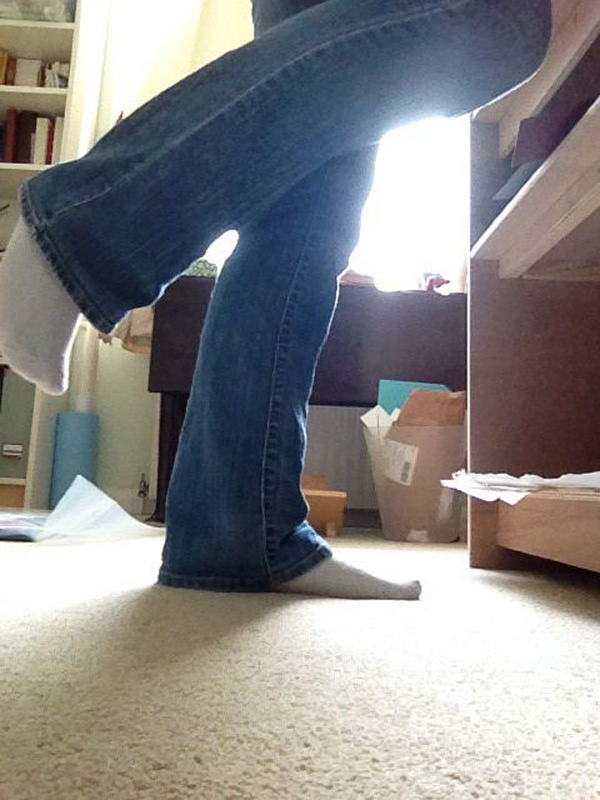 And I can bear witness to the fact that Sarah really does lift up one foot when she cuts! And I’ve used this method at home already. I learned something!! I’m glad it was helpful, Daria! Thanks for commenting, and best wishes. Thanks for that tip, MJ! The carpet tape is a great idea. 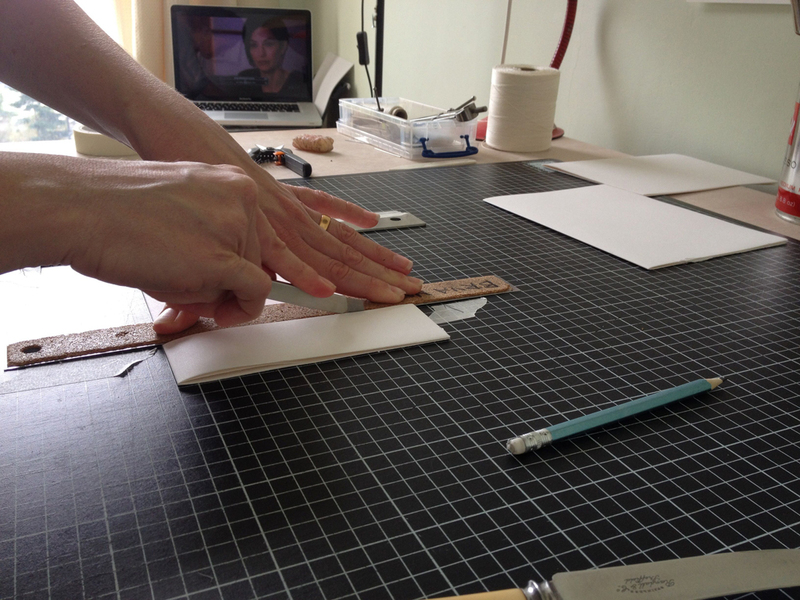 When I’ve cut large numbers in this way (or set up a similar jig for scoring) I have used binders board secured with some double stick tape, but I found that my action with the ruler would gradually move the boards and cause me to score in the wrong position. But carpet tape would be much more secure. Thanks! This was very helpful! The pictures helped me get a really good sense of the process. Thank you! Hi Julia, I am so glad these instructions were helpful! Thank you so much for these detailed instructions! 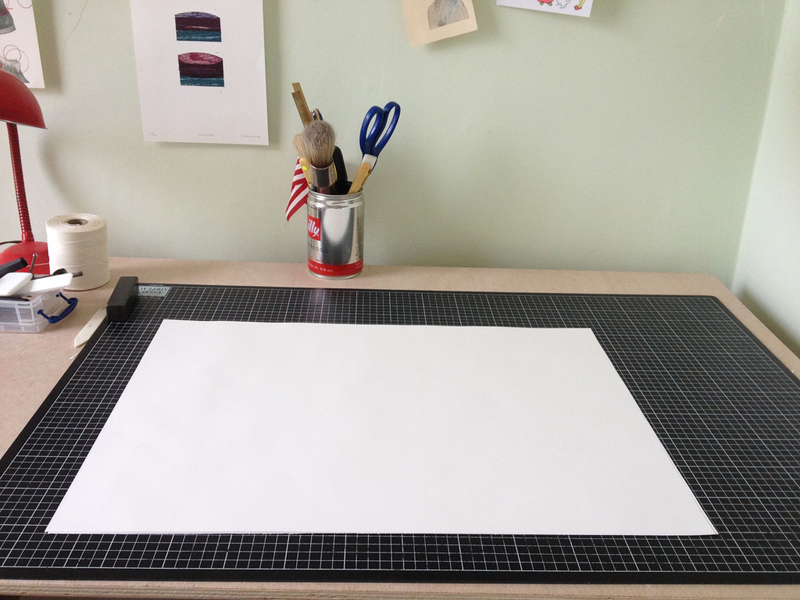 I actually purchased a 24” Kutrimmer for box-making/cutting bookboards. Now just starting to learn book binding and 1st attempt at a casebound book was a disaster, specifically because of trying to trim the signatures after sewing and glueing the end papers.All of the instructions I’ve read or watched had me trimming the signatures after the text block had been sewn. It was too thick to trim with the Kutrimmer. Do you always recommend trimming before sewing into a text block? 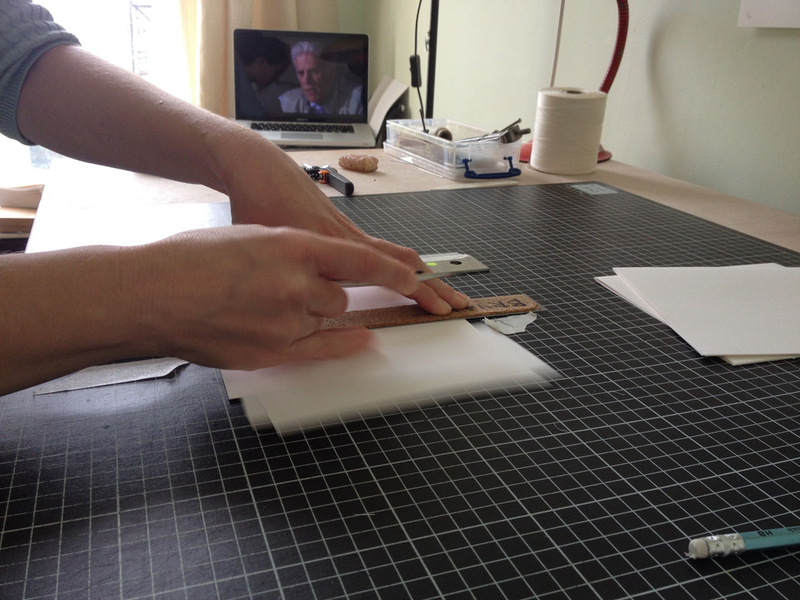 Does your work stay smooth and lined up after sewing? Thanks for any advice! Also selfishly happy you are in the U.S.A. again! I hope your new journey is going great! 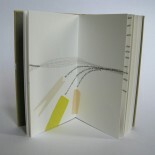 This entry was posted on October 2, 2013 by Big Jump Press in Bookbinding, How I do things., Workshops and Teaching and tagged book arts, bookbinding, bookbinding without equipment, trimming sections.